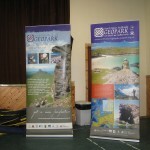 On Saturday, 3 November there was a public meeting held to bring everyone up to date on the goings-on to do with the Geopark. George Farlow – one of our Highland Councillors and chairman of the Board of Directors for the Geopark – very kindly drove 22 miles out of his way to come and pick me up in Lochinver to take me up to Scourie to attend the meeting I’m especially glad that he did this for me as, I am ashamed to say, that out of the 50 or so people who were at this meeting, I was the only person from Assynt! It was an absolutely glorious late autumn day, and we were a bit worried that few people would turn out for this meeting in that folk might prefer to be out and about in the countryside or doing those all important winter tasks in the garden – days such as this are few and far between round here! The meeting was due to start at 2.00 pm but there was lunch provided beforehand at The Anchorage, the café overlooking the bay in Scourie. There was a bit of a problem with this as our meeting almost inevitably clashed with another event – this was a soup and sandwiches lunch held in aid of the Highland Hospice, and The Anchorage was packed. However, all who needed it got lunch and it turned out rather well for both. 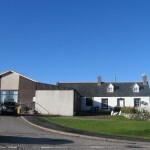 Most of the people who were entitled to a free lunch for the Geopark meeting paid their fiver anyway for the Hospice, thus swelling their coffers, and some folk who had basically come for the lunch made their way up to the Village Hall for the meeting. George started proceedings right on time, and his first and probably most momentous news was that our Geopark has now been made into a company limited by guarantee. I gathered that just now this company has no money and in fact has been rescued by support from the five Community Councils in the area not all of which fall within the Geopark – including Ullapool which I find to be a rather encouraging sign in that Ullapool as a village has always been rather good at setting up things which bring in revenue, things such as their various Festivals which go from strength to strength year on year. I can’t help but think that if people in Ullapool see possibilities in the Geopark, then those possibilities probably do exist:-) The Headmaster of the secondary school there and keen amateur geologist, Peter Harrison, has been a member of the Steering Committee for some time, as has George who joined in 2007. The Steering Committee has now been wound up and replaced by a Board of Directors and one of the reasons for this meeting was to appoint more directors – either through nomination or through public acceptance at the meeting – and this was achieved on the day, which wasn’t bad going! 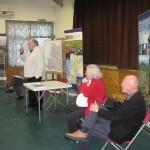 There were a couple of other directors at this meeting who took the platform alongside George – one Stuart McHugh and also Kevin Crow from Loch Croisdale Books – the bookshop at Balnakeil Craft Village on the north coast. I was extremely impressed when he greeted me with obvious recognition in that it has been two or three years since I was last in his shop. What a memory he must have given the number of people that pass through the door of his shop! There was also a chap taking the minutes of the meeting but I didn’t manage to ascertain his name, and Donald Fisher was lurking somewhere in the audience! George went on to tell us that we had very nearly been “red carded” by UNESCO which would have meant that we would have lost our status as Global Geopark, and that would have been a great shame as we were 15th when the park was set up and there are now 52 world-wide! But a strong letter of support was forthcoming from SNH (Scottish Natural History) and so we only got a “yellow card”. That is a warning that we need to get cracking with the plans for the Geopark. This won’t be easy for us – we have a very small population on this most under-populated coastline in Europe. Given our somewhat limited human resources, demanding that we get a move on is a bit unfair in my opinion! 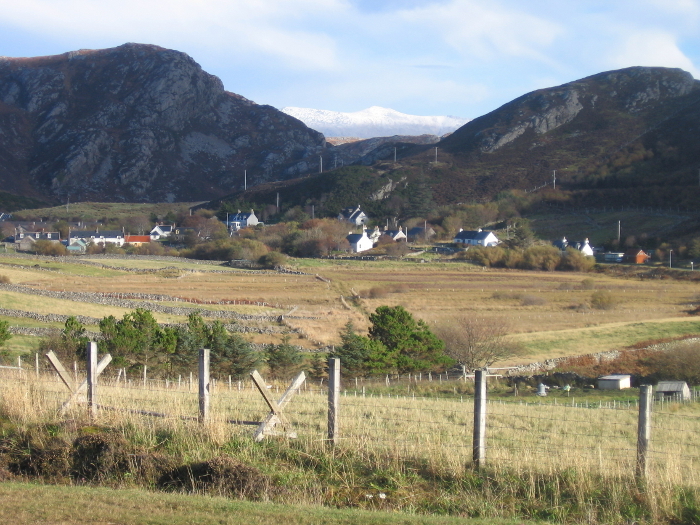 But we now have to start applying for funding to employ people to put together a business plan with a vision for the future which will include such things as earth science education; to build the planned Geo-centre in Scourie; to create an all singing, all dancing web-site, to employ a Geo-ranger for guided walks and to help educate children (much in the same way as Andy Summers does for wildlife round here); and to work towards achieving charitable status. In fact, we need to find a Geo-scientist and a business administrator pretty quickly just to stay under the UNESCO umbrella! Of course, it is a bit of a chicken and egg situation, but we do our best. 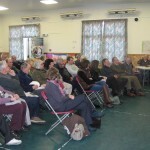 Anyone in the community is welcome to put their own ideas forward – this is very much an open, democratic organisation. After all, when push comes to shove, we all live here. But when an organisation such as this needs help, this is a big task! You may be wondering – along with quite a few folk round here – why we are making such a fuss about a “Geopark” when the mountains will be here just about until the sun goes super-nova! But it is important. For one thing, without the geo-diversity we wouldn’t have the bio-diversity, and the land affects culture as well. Everyone appreciates the cultural importance of Ayers Rock for instance, but the landscape round here has as much helped create the culture of this area as Ayers Rock has the culture of people who live there. This is especially true when it comes to the Gaelic songs so many of which are related to the land one way or another. Up here as well there is the oldest evidence of life in Europe. We need to be able to share and disseminate this sort of knowledge, and a properly set up Geopark with its own visitors’ centre is one very good way of doing just that. 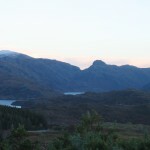 The landscape round here is very special, containing as it does some of the oldest rock in the world which creates a unique flora and fauna, and has contributed to world history in quite a major way through the work that Peach and Horn did here which eventually produced the theory of plate tectonics. It needs to be protected from the worst ravages of human activity and the Geopark will play an important part in providing that protection. 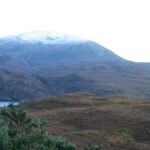 This entry was posted in Landscape, Local area and tagged Geopark. Bookmark the permalink.